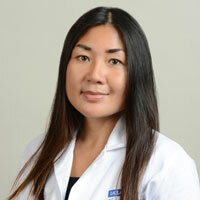 Dr. Hutchinson is board certified in internal medicine and received her medical degree from the Medical College of Wuhan University of Science and Technology in China. She completed an internal residency program at the Drexel University College of Medicine/Saint Peter’s University Hospital. Prior to joining Harvard Vanguard, Hutchinson was a lead physician for COMPASS, a pioneer program funded by CMS to manage cardiovascular disease and diabetes in patients suffering from depression at Mount Auburn and Cambridge Independent Physician Association. Dr. Hutchinson enjoys traveling, dancing with her daughters, and teaching them to live healthy and fulfilled.